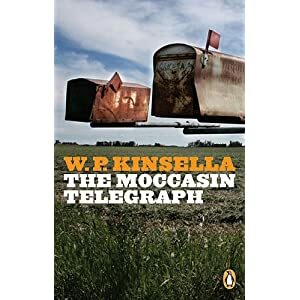 The Moccasin Telegraph by WP Kinsella (CDN, USA) is the second book of Ermineskin short stories I've read this year. This book is only Kinsella's third set on the Hobbema reservation, published in 1983. The characters are well-developed and definitely not caricatures, although sometimes the Medicine Woman, Mad Etta, verges into that territory. The humour is less slapstick than in the books focusing on Frank Fencepost, it's more wry and in some stories is barely there. The theme in this book is disappointing others. From a daughter catching her father stealing her hard-earned money, hunters who get bamboozled by Frankie and lose their car to Silas, to a husband who secretly turns to the old ways despite putting on a front to his wife, or the government who constantly disappoints everyone. The key is to how you deal with disappointing someone or being disappointed, but Kinsella's characters are kept real and sometimes they don't deal at all. My favourite in the bunch is The Mother's Dance. It begins and ends with the same paragraph about a dance involving babies lifted to the sky. The way it gets to the creating of that dance is thrilling in a way that Kinsella's stories rarely are. The enjoyment of an Ermineskin story is usually in just sitting back and laughing but this plays out like a Grisham novel. The government tries to evict some families based on a tiny deed some of their relatives may have signed decades before. The whole situation is highly unfair but it doesn't look like there's a way out until an overtly acknowledged case of deus ex machina, where a rich Indian woman comes in and magically gets the court to back down. How she does it doesn't matter- what matters is how the people come together to thank her, not with money or gifts she doesn't need, but with a dance. I have to admit that half the pleasure for me in these Hobbema books is how nostalgic it is for me. Even when I go back to my hometown the stores and the places of the 80s when I grew up are gone. But they're still around in Silas' world, and I remember a lot about my own youth through plot points mentioned by Kinsella. This is the 14th book I read for the 5th Canadian Book Challenge.